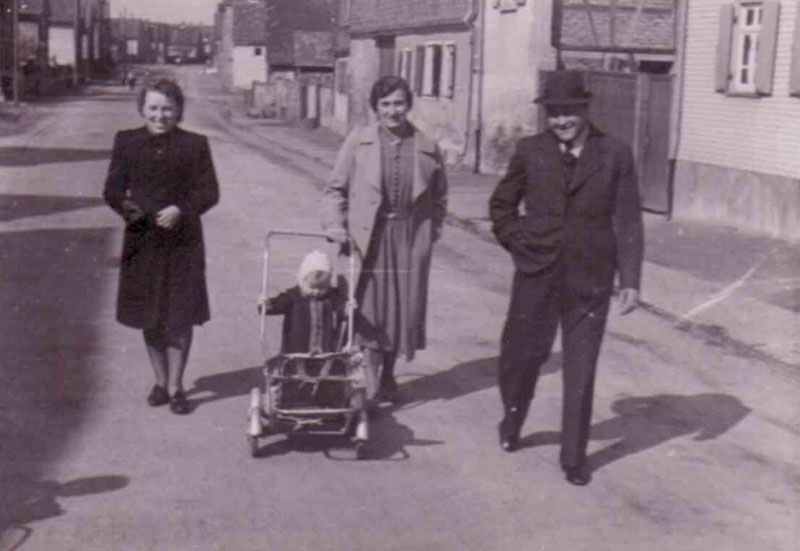 The mother of the author as a little child in April 1942, evacuated to a small village outside the city of Frankfurt. Britain: 50 London firemen killed and 501 injured during September. Germany: The mother of the author of this websites was borne in Frankfurt, Main. Battle of Britain (Day 82): Five attempted raids on London. Aircraft from first and second raids jettison bombs over Hastings and Bexhill. 30 Ju 88s from fourth raid reach western suburbs of London, causing some casualties. 40 Heinkel He 111s (4 lost) escorted by Me 110s, sent to Westland Aircraft Factory, Yeovil, but miss target and bomb Sherborne (Dorset); 5 Hurricane fighters shot down. Aircraft losses: German, 47; British, 20. Night raids on London by 218 aircraft: bombs fall mainly on suburbs. Other targets include Liverpool (some fires). RAF night raids on Berlin, invasion ports, airfields and numerous other objectives in Germany and Occupied territory (5 aircraft lost). 72 RAF bombers attacking Hamburg and dropping 93 t. of bombs. Battle of Britain, aircraft losses 7-30 September: German Luftwaffe 433 planes, British Fighter Command 242 fighters. 6,532 t of bombs dropped on London in September (RAF dropped overall 390 t of bombs on targets in Germany since May 1940). Operation Hummer (Lobster): three German agents put ashore from seaplane on coast of Banff, Scotland. All captured; two executed. The third, double-agent Vera von Schalburg, disappears. Merchant shipping losses in September 1940: 92 Allied ships with 403,504 tons in Atlantic, 8 Allied ship with 45,117 tons elsewhere. 6 Axis ships with 21,466 tons in Mediterranean. 0 U-boats sunk in the Atlantic, Arctic or Baltic. 28 serviceable U-boats in Atlantic.